It was a gorgeous Saturday afternoon in the Bay Area. Spring was finally here (well actually in the Bay Area, spring comes and goes when it feels like it. Kinda like a case of relatives you don't really like coming over when you least expect it) but in this case, spring was actually here. Not a cloud in the sky, warm weather, nice cool breeze and the occasional concussion when you get in the way of someone playing fetch with their dog. 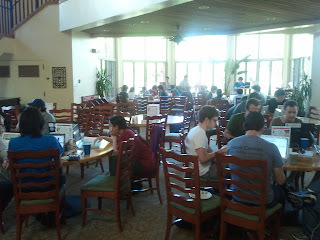 Given the setting, I was honestly a little apprehensive approaching our hackathon in Stanford. It just seemed like a day that was usually spent on the sand with a beach ball and not a lot of clothes. Considering that we're entering a community of mostly students, I fully expected to step into the venue with a bare handful of attendees plonked in the middle of a bunch of snoring frat guys hung over from the night before. Joget Workflow developers are committing full force into the development of Joget Workflow v3.0, with the vision of building a full-fledge workflow application builder that will redefine simplicity in software development. However, at the same time, our team is also committing enthusiasm into community engagement, to promote Joget Workflow into other strong geeky Web developer communities, by bringing down the barrier for Joget Workflow adoption. Within less than 2 months, we have released a set of plugins for WordPress integration, Drupal integration, and now ... Google Apps integration!